Posted on May 12, 2014 by Nida S.
Every other year, it seems like the world will end and then, it doesn’t. It sometimes gets difficult for sunlight to pierce through this widespread, inner darkness. Negativity breeds faster than rabbits. Amid this bleak invasion, we occasionally blow it all out of proportion. The good, the bad and the exaggerated all gets muddled up like water colors mixed with water. But if we look closely it’s not hard to understand that some truths are simple. They are not really good or bad or even unbelievable. Truths that echo our varied existences during different points in time. Truths that are not meant to be judged. Hard to believe but there was a time when one person in the entire neighborhood had television and all the children gathered during prime time to watch black and white cartoons. That was not exaggeration. It was the truth then. Now any child who does not own a laptop, cell phone or television is like a dinosaur treading Manhattan. This is not exaggeration either. It’s a simple truth. Or when it was normal to have ten siblings at home. A ridiculous notion in our eyes today, but a common truth back then. Now, remaining childless by choice is an acceptable norm. Or how it was something of a herculean task just to say “I love you” to parents. Now, people we love have ‘days’ named after them so we can show them we care. Another truth that just is. Why create days to celebrate such simple, overstated truths? We know we love our parents. No one puts us on gunpoint just to say those three words. What’s the underlying concept anyway? Mother’s day founder, Anna Jarvis created the idea to “memorialize her mother by working to promote a day that would honor all mothers.” She was against the entire commercialization of the day based on simple truths of heartfelt emotion vs. greedy profiteering. While this is a noble idea for drawing-room, virtuous talk, it’s just that. Talk. While I do understand and nod fervently on her basis for this, I can’t seem to make mends with her extreme disgust for florists, card companies and anyone else who ended up making money out of Mother’s day. If the world profits from beastly things like weapons, disease and terrorism, then what’s the harm in earning a few more bucks on days of love and joy. That’s just how this world works. We profit out of everything. Someone dies, there’s a whole line of people waiting to fill their wallets; From gravediggers to funeral home owners, to catering businesses. Where natural disasters destroy lives, they also make the lives of many working to resurrect lost lands and infrastructures. So if you love someone and feel the need to go slightly over the top in your expression, do it! Even if it means a hurried trip to put some money in Hallmark’s account. We are already exploding with cynicism and hatred to appreciate the true emotions in life. So if a few days in the year connect us with feelings that may have numbed over time or neglected, then why not? And if you are the perfect son or daughter who shows love every day, then another day to express your love should be a bonus. That does not mean that love for our mothers, fathers, siblings, friends, teachers etc. has been confined only to these ‘days’. Nor does a showy post on Facebook give you extra points because you wrote a love-filled status and others didn’t. It’s just a method of expression, just like there are different ways to get from one place to another. This transfer of emotions is like a ride on a hot air balloon. Different. Exciting. Showy. At times pointless. But still a wonderful mode that gives us wings to escape from mind-numbing routine and to forge stronger bonds. 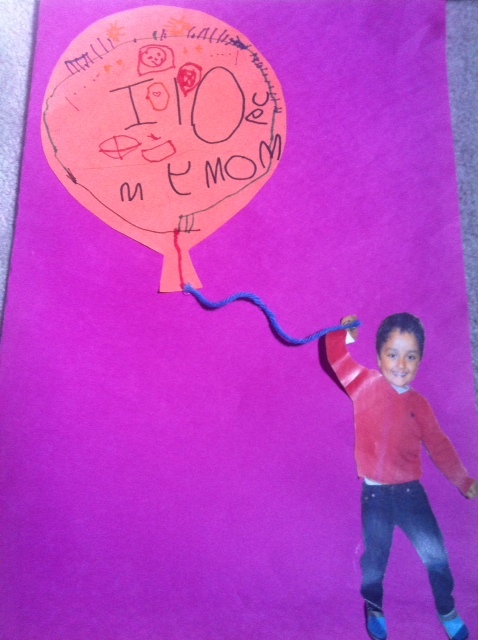 This was the first year my four-year old son came home with a Mother’s day card. And I did not mind one bit that the chart-paper, crayon, glue and printing companies earned an extra buck because he and so many children around the world chose this way to say ‘I love you mom’. A truth, that is what it is. Simple. Great post, it gave me some background on the holiday I didn’t even know about and it gave me something to think about. Well done! Thank you Sarah:). Did you get a chance to read the full article that I linked about Anna Jarvis? Her life, especially her death is ironic and morose. I really liked this post! I agree with everything you wrote. As a ‘young’ mother of two (29 is young, right?) 😉 I find myself feeling bad that I’m not more of a ‘feminist’. I don’t have a career and I personally liked having a day where my kids took the extra time to make me a special card and help their dad make me breakfast. I’m certainly not of the Sheryl Sandberg “Lean In” mentality and I do take pride in being a homemaker. I suppose that I just need to accept my position in life and be OK with it because it’s what’s right for me and my family. Can’t we just be who we want to be? And that Anna Jarvis was a serious nut job. Great post. It’s a lovely thing to have days when we are encouraged to stop and think, and show appreciation to those special people in our lives. A hand-made card is just as special as a purchased one. It’s the jewelry commercials that get to me, it puts pressure to give love a material incarnation. Having said that, I do agree that showy or not showing love is love and that’s all that matters. Jewelry and expensive perfume! But yes, you said it at the end. Love is love and that’s all that matters:). Thank you so much for reading! I like the irony of th florists paying her “insane” bill! 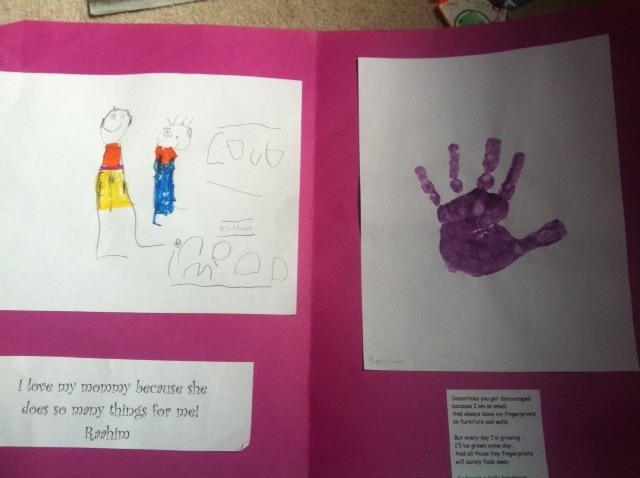 Mother’s Day is what each and every child makes it, it can be grandiose or simple. Sometimes simple is best, but if we can do grand, then why not. What a well written article, pointing out the discrepancies and vagaries of daily living. Agree about Negativity spreading gloom quickly. But a small ray can make a big difference at such times. We all live with our half truths, which can be half lies very well! Illustrious daughter of an illustrious father. Proud of both of you.